Beginning the second leg of his South Asian journey, Pope Francis did not mince words when he addressed government and church leaders of the Philippines on Jan. 16. A day after his triumphal arrival from Sri Lanka, he called on them to combat and eliminate “scandalous” social inequalities and injustices as well as the corruption that is widespread in this archipelago of 100 million people, more than 50 percent of them mired in poverty. During a speech at the Presidential Palace, he told President Benigno Aquino III and the nation’s other political and civic leaders that if they are to face “the demands of the present” and “pass on to the coming generations a society of authentic justice, solidarity and peace,” they must “ensure social justice and respect for human dignity.” This is a “moral imperative,” he added. Later, during Mass at the Manila Cathedral, Pope Francis said, “The church in the Philippines is called to acknowledge and combat the causes of deeply rooted inequality and injustice that mar the face of Filipino society, plainly contradicting the teaching of Christ.” He told the country’s bishops and clergy that “the Gospel calls Christians to live lives of honesty, integrity and concern for the common good.” He put them on their guard against “the great danger” of “a certain materialism that can creep into our lives and compromise the witness we offer. Pope Francis’ concrete concern for the poor reappears again and again, and this day in Manila was no exception. 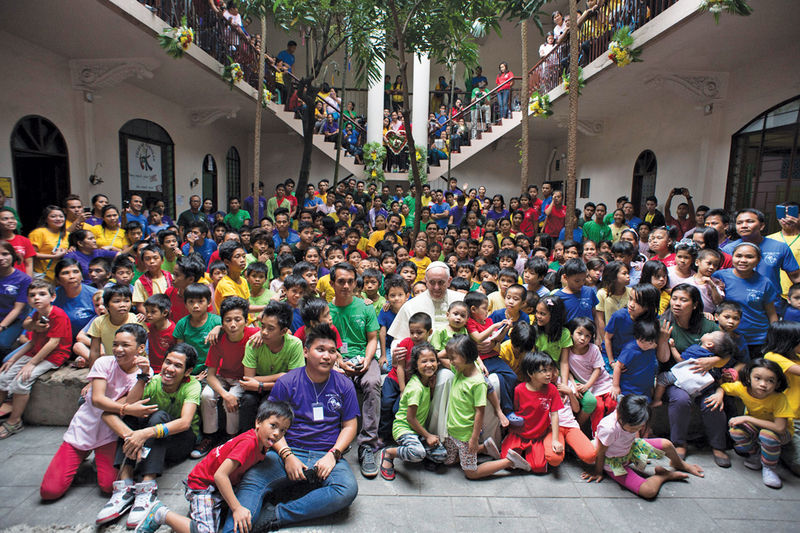 After Mass he visited a center near the cathedral where he met former street children; he talked with them and embraced them before imparting his blessing. One does not have to walk far in this metropolis of 10 million people to see the poor Filipinos the pope is speaking about. This same poverty has forced 10 million Filipinos to emigrate to find work elsewhere. The need for social justice and elimination of inequalities is an urgent need in this country. Pope Francis’ forceful call for this is timely and, given his moral authority, it could be a game changer. This article also appeared in print, under the headline "Pope Urges Government Response To Poverty as ‘Moral Imperative’," in the February 2, 2015 issue.